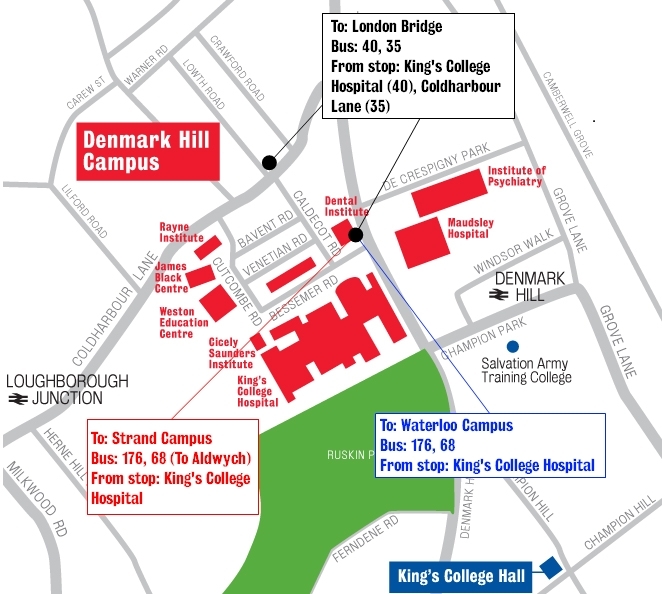 London Dental Education Centre (LonDEC), part of the Dental Institute (also at Guy's and Denmark Hill). London's South Bank Centre which includes: the National Film Theatre; British Film Institute (BFI); Royal Festival Hall; Hayward Gallery; National Theatre. Young Vic and Old Vic theatres are nearby. The Franklin-Wilkins Building, one of London's largest university buildings and completely refurbished and opened in 2000. From the west, Putney - Blackfriars: get off at either Embankment Pier or Blackfriars Pier. From the east, Woolwich Arsenal - Savoy: get off at Blackfriars Pier. There is no car parking available on this campus. There is an APCOA car park on Cornwall Road. Stamford Street is a red route. Lambeth Council cycle racks are available in front of the Franklin-Wilkins and James Clerk Maxwell Buildings. Bicycle parking is available in the bike shed at the back of the Franklin-Wilkins Building on a long term bookable basis. Please contact the ETDE helpdesk for details. No public parking. Motorcycle bays are available in Cornwall Road. Bicycle stands are outside the front entrances of Franklin-Wilkins and James Clerk Maxwell buildings. 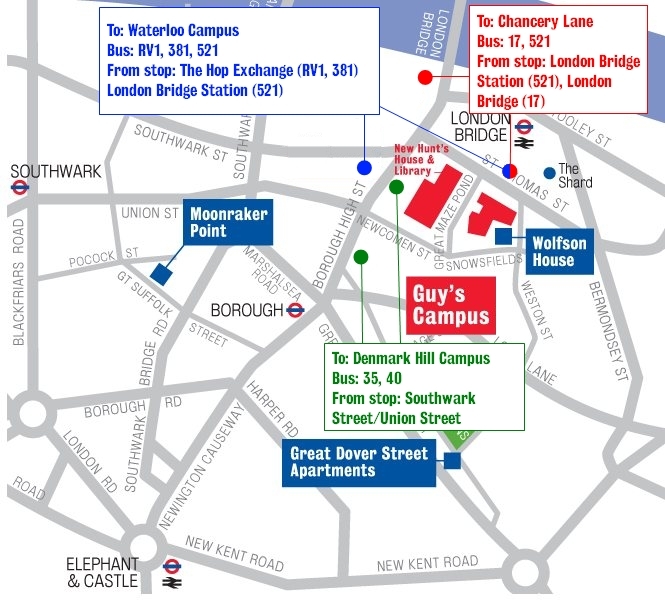 25 minute walk: from the Guy's Campus exit to Borough High Street cross to Southwark Street and walk west into Stamford Street. From Great Guildford Street take the 381 towards Waterloo. Bus stops near Guy's Campus. From Denmark Hill Take the 68 bus towards Euston or 176 towards Waterloo Bridge Road. Bus stops near Denmark Hill. 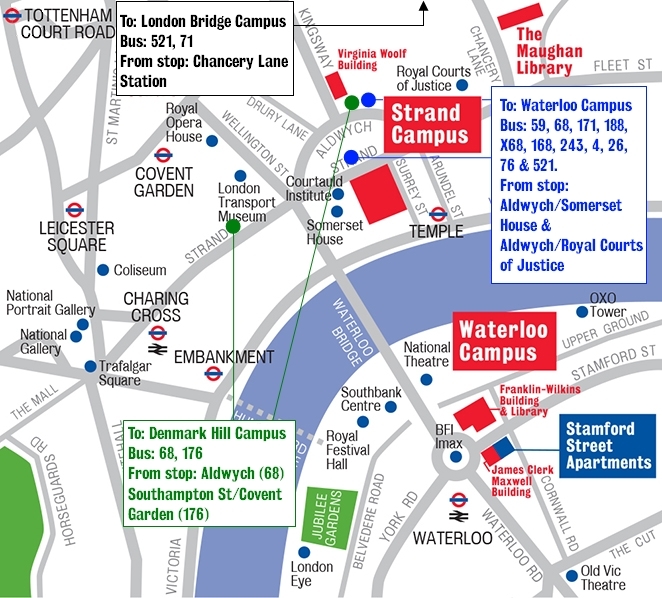 From Strand Campus 12 minute walk: from the Strand, walking west, turn left on to Waterloo Bridge and left into Stamford Street for the Franklin-Wilkins Building or across Stamford Street for the James Clerk Maxwell Building. Take any bus that goes across Waterloo Bridge and get off at the Waterloo side of the bridge. Bus stops near Strand Campus. Take the District or Circle line to Temple, then change and take Bakerloo or Northern line to Waterloo. From St Thomas' Campus From the hospital site exit across Westminster Bridge and walk straight on along Belvedere Road. Passing under Waterloo Bridge opposite the National Theatre turn right up to the London IMAX. Take the RV1 bus to the Royal Festival Hall. Bus stops near St Thomas' Campus. 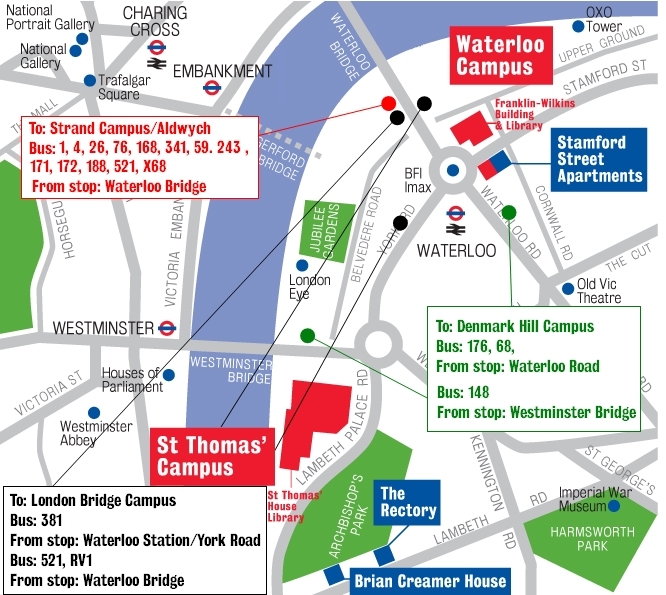 Walk across Westminster Bridge to Westminster and take the Jubilee line to Waterloo. A Drug Discovery Group seminar with Kate Lauder.